British Cycling and HSBC UK have announced that they will be returning to Nottingham in September following the success of last year’s free, family cycling event. HSBC UK Let’s Ride Nottingham (formerly HSBC UK City Ride) will take place on Sunday 16 September. Six kilometres of roads will be closed to motor traffic to give thousands of locals the perfect opportunity to explore their city on two wheels, taking in iconic city landmarks along the Victoria Embankment, crossing Trent Bridge and passing the City Ground. This year’s event will have a strong community focus, showcasing everything that’s great about Nottingham. More than just cycling, the event will include various activation zones including sports, kids’ activities, music, food and cultural experiences in partnership with a number of community organisations. 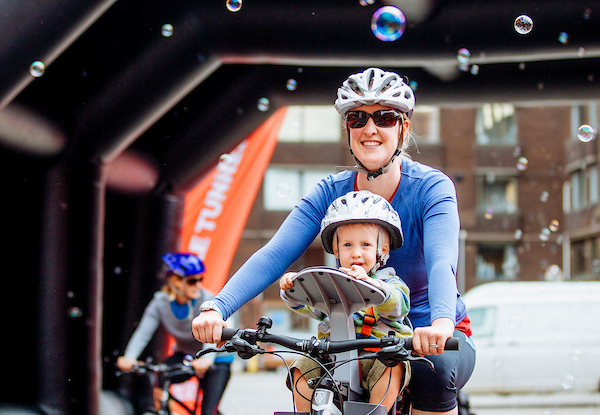 HSBC UK Let’s Ride Nottingham will be the penultimate in a series of 14 events across the UK this summer, which are a key part of British Cycling and HSBC UK’s vision to get two million more people on a bike by 2020. Over 100,000 people attended last year’s events, cycling a combined total of over 1.5 million kilometres in the process. Councillor Dave Trimble, Portfolio Holder for Leisure and Culture, Nottingham City Council, added: “Cycling is a key priority for Nottingham City Council, as we seek to encourage more people to jump on their bike whether it be for travel or just for fun. Hosting HSBC UK Let’s Ride at Victoria Embankment provides people of all ages and abilities the unique opportunity to cycle on the city’s roads free of traffic, and enjoy the family festival atmosphere we are looking to create. British Cycling is the national governing body for cycling as recognised by the UCI – the international federation for the sport. Based in Manchester at the National Cycling Centre, British Cycling works across all levels and six disciplines of the sport (BMX, Mountain Bike, Cyclo-cross, Road, Track and Cycle Speedway), from providing the support and encouragement people need to get riding their bikes for the first time, to being home to the hugely successful Great Britain Cycling Team. Continued success at the highest level is inspiring a boom in participation across the nation. There have never been more opportunities to ride a bike, be it for fun or sport, and British Cycling is at the heart of this growth. British Cycling also works hard to represent cyclists’ interests at all levels, including campaigning on important issues including road safety. As a membership organisation, British Cycling provides a suite of benefits and support to its members who currently number over 137,000. All membership revenue is invested back into cycling.